Just before the Thanksgiving holiday, we here at Frost Science participated in the Miami-Dade Heart Walk, a special event created to raise money and awareness for combating heart disease, the leading cause of death for both men and women in the United States. Developed by the American Heart Association, the event has been a staple of the community every November, encouraging walkers to cheer on survivors, remember those who are no longer with us, and get moving as a family and community to help prevent cardiovascular diseases and stroke. The two primary event sponsors were Baptist Health South Florida’s Miami Cardiac & Vascular Institute, and UHealth (University of Miami). For the first time, the Heart Walk main event took place in Museum Park, our new backyard— and we could not wait to join in on the fun. The event provided us with the perfect opportunity to try out some new ideas and give a sneak peek of the new Baptist Health South Florida People and Science Gallery, a 9,000-square-foot exhibition designed to explore the choices we make everyday and how those impact our health and happiness. The gallery will focus on the latest science in five zones: eating, exercising, relaxing, connecting with others, and learning, and is scheduled to open in Summer 2016. 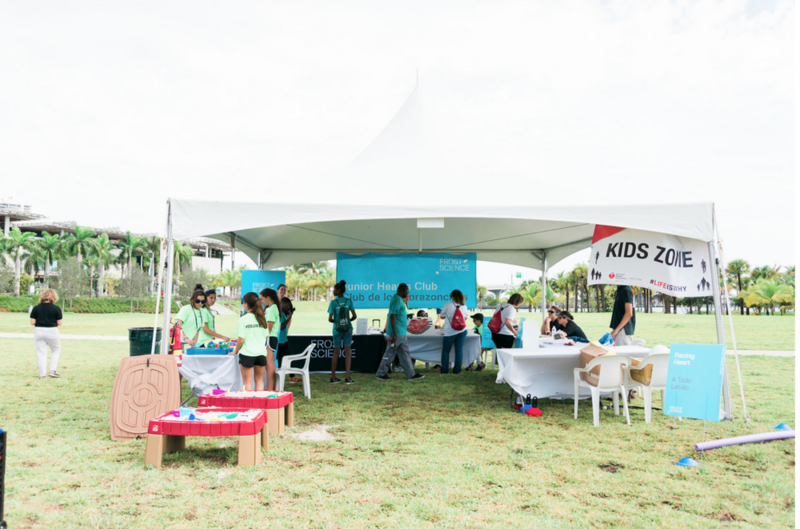 For the Heart Walk, Frost Science sponsored the Junior Hearts Club, an area where kids of all ages took a journey through the heart via an action-packed obstacle course that simulated blood flow in our bodies. Walkers were then able to relax and lower their blood pressure by playing in our sand Zen gardens. Participants could also explore the anatomy of the heart with coloring sheets, discover sneaky salt in foods, and even tell us why they were participating in the Heart Walk through a beautiful string heart activity. With over 5,000 walkers at the event, the day was a great success and the weather even cleared up, offering a beautiful sunrise right before the walk began. We look forward to the event in 2016!